I write this now in the wake of the devasting news of the fire that destroyed parts of the cathedral of Notre Dame. At this time, it is still unclear how much damage has occurred, how much has been lost, but words like catastrophic do not seem out of place. This image is particularly hard to wrap my head around because, just a few days ago, I was there with my family, gazing at the towering white walls, marveling at the feat of art and architecture and beauty and craftsmanship. I cannot imagine the grief and shock that many Parisians must be feeling now. I am not French, nor am I Catholic, and my recent visit to Paris was just that, a visit. I did not grow up in the shadow of the cathedral, have never attended a mass there. But as a person of faith and as a lover of art, my heart does go out to all of those people, living and dead, who hold and have held this holy space so dear. I feel lucky to have seen it and walked in its walls, head back, eyes up, awed. I feel lucky that I was able to share that awe with my wife and daughter. but the beginning of terror, which we still are just able to endure. This may seem to harken back to a kind of Old Testament God, one that is feared as much as loved. And with terror being such a loaded word in today’s context, it may seem odd to connect it with the experience of beauty. But I think what Rilke tries to express is that overwhelming sense one gets in the face of a beauty that is larger than any one person, a feeling akin to standing at the edge of the ocean during a storm. There is so much power there, in that immensity, and it could annihilate me if it chose to, but it has no need. Instead it exists serenely; it just is. In a way, experiencing Notre Dame was like that for me. Taken as a whole, it feels immeasurable. You cannot see it all at once. You lose your place within it. But in a different way, I found parts of it incredibly human-scaled and intensely close to hand. For example, passing by the sculptures that depict the blessed and the damned, I could imagine the sculptor, whoever he was, working with the stone, chiseling out the curve of a heel or the strap of a sandal. In the same way, touching the wooden railing as I climbed the steps, I thought of that piece of wood on a lathe. Someone, at some point, worked over it, turned it, put his hands to it and made it what it became. So now comes the hard part, rhetorically speaking. The part where I segue into picture books. Maybe I don’t need to, maybe just writing about the cathedral is enough, but the truth is, when I was there in Paris, I had a moment of understanding that is speaks to this same back and forth, between the immensity of the unknowable and the familiarity of the knownl, between the grandness of the towering arches and the humanity of the sandal strap. 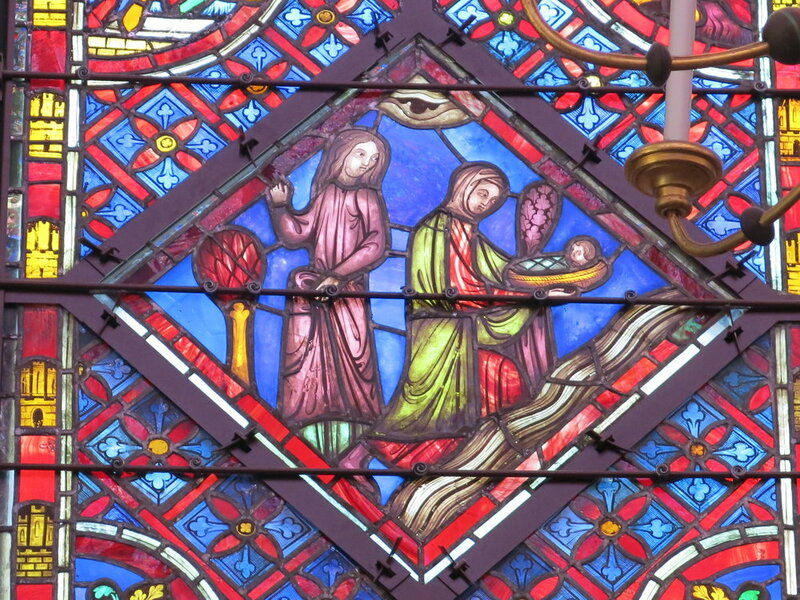 This occurred to me not in the cathedral, but in the nearby Saint Chapelle. Saint Chapelle is another amazing visual experience, a chapel filled with towering arches of stained glass. My family and I walked into it through the first set of doors, which placed us in a relatively low-ceilinged chamber where they have set up a bookstore and gift shop. A little disoriented, we looked for the “real” entrance, only to find a small spiral staircase leading up. We were not ready for what awaited us. The overwhelming wash of color that streamed through the glass in the chapel, even on an overcast day, was incredible. The word symphonic comes to mind, as I imagine that if I had synesthesia, this vision would induce a gorgeously large, perfectly harmonious chord. Again, there is immensity. But as I gained my footing, I began to look at some of the individual pieces, or frames, in the glass, and realized that each one was basically a story. This idea is, of course, nothing new; cathedrals are often called liber pauperum or “the poor person’s book,” but I was understanding and experiencing it in a new way, in part because I was looking at these pieces through the eyes of an illustrator, and in part because I was there with my daughter, who is still freshly learning some of the Bible stories they depicted. So, we go back to this push and pull between the overwhelming effect of the windows as a whole, and the narrative information contained in the details of each frame. You can lose yourself to the wash of color and light, then find yourself again in the familiar figures and stories. But what struck me, too, is that there are some frames that are simply too high to see clearly. From my perspective on the floor of the chapel, these frames can evoke narrative, but I couldn’t say for sure what those narratives were. All of this, the patterns, the iconography, the translucent colors, and the sense of an evoked story reminded me of the work of an artist I love, Pamela Zagarenski. Zagarenski has won the Caldecott Honor twice, once for her illustrations in Sleeps Like a Tiger, written by Mary Logue and once for her work on Red Sings from Treetops: a Year in Colorwritten by Joyce Sidman. 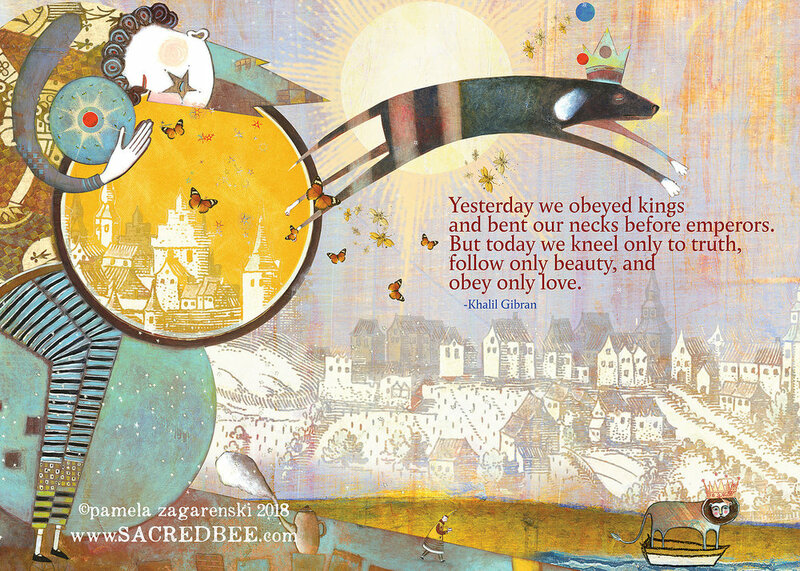 Throughout her work, Zagarenski populates her page with characters and animals, tea cups and magi, decorative bits of heraldry and what seem like alchemical notations. I see in Zagarenski’s illustrations an insistent push toward more story. That is, these paintings, with their unnecessary but enchanting crowns and wheels, the suns and moons and flags and textures, all seem to invite us, as viewers, to imagine more story than what is spelled out by the text. When I say “unnecessary,” I don’t mean to be derogative or dismissive. I just mean that these images are not called for by the words. There is nothing to suggest that the characters are royal. So the crowns then function on some other level, suggesting a kind of kingliness or royalty of spirit, maybe. They provoke questions; they evoke story. Now, in a sense, that is true of most good illustration. The images should do more than just echo the words. But Zagarenski’s pieces seem to take it to an entirely different level, suggesting worlds of story at the edges and in the background, in the details that might get overlooked on a first read. They help create a dizzying sense of possibility, all while maintain the clear narrative of the actual text. That push and pull is amazing to me, both incredibly inspiring and ultimately uplifting. And this finally seems to be one of art’s gifts to us. In those moments between bewilderment and recognition, at the beginning of beauty and the edge of terror, art offers us this serenity, this enlarging of our selves, this grace. Like a lot of households nowadays, ours is in the midst of a Marie Kondo assault. If you haven’t seen her Netflix series, Tidying Up, or read her book, The Life Changing Magic of Tidying Up, then in all likelihood, you know someone who has. She is everywhere. Her name has become a verb. The other day, a friend on Facebook crowed that he had Marie Kondo’ed his closet and that he felt amazing. Across the country, thrift stores are reporting record levels of donations, as folks divest themselves of all the stuff they really don’t want anymore. The magic Kondo creates has to do with the idea of joy. Some things bring it, but most things do not. We surround ourselves with stuff, but probably only a fraction of it gives us any real happiness. By getting rid of everything that does not “spark joy,” we can declutter our living spaces and build intentional environments designed to make us happy. I love this phrase, “spark joy.” It captures the electric effect that some items have on us, and seems to speak to a kind of potential energy that particularly potent items store inside themselves. They wait on the shelf of a junk store or in a dark attic, just hoping for the right touch to come and close the circuit, releasing that spark. To my mind, these items are almost always old, well-used, maybe even a bit broken down. Part of my particular spark comes from the knowledge that other hands have touched them, other bodies have worked them through the world. It is as if the item itself was a kind of medium for communing with bygone days. I don’t get that feeling from new things just off the rack, but that’s just me. Which gets me, finally, to my point. You can tell a lot about a person based on their stuff. Or, perhaps even closer to the point, you can SHOW a lot about a person based on their stuff. I am thinking now of illustrations, particularly illustrations that show characters in their environment, and how that environment does the work of characterization. For my examples, I want look closely at the wonderful book The Storm Whale, by Benji Davies (2013 Henry Holt). In The Storm Whale, a lonely little boy named Noi finds a beached whale and tries to bring it home. Keeping the whale is an impossible task, but the act of dealing with it brings Noi and his dad closer together, changing their home forever. All this in, by my count, 267 words! Brilliant. So how does Davies make us understand this transformation? One way, I think, is through his depiction of the things in Noi’s environment. In the first page, we see little Noi standing outside his house playing with shells and sticks and leaves. The text reads “Noi lived with his Dad and six cats by the sea.” That doesn’t sound lonely, does it? But if you look, these cats aren’t playing with him. In fact, it’s really hard to even find the sixth one, which (I think) is just a black smudge under the flower pots by the shed. Instead, Noi is on his own, playing a made-up game with stuff the ocean has left him. The house is big and dark and weather-beaten, but the colorful flags outside keep it from being foreboding or scary. In the next spread, we see Noi at the kitchen table, eating breakfast. Again, some of the cats are around, but they’re not necessarily playmates. The space is wonderfully utilitarian: one table, two chairs, a couple cooking utensils, the old wooden stove and the cuckoo clock. These details seem to describe Noi’s life: pared down, spare. They set the mood of the home completely. Davies includes little homey touches like the toy boat, the picture of the cat, and the porcelain bowl, but overall it seems like a pretty simple life. No TV or radio, hardly any toys other than the twigs and pebbles Noi brings in. So we’ve got a curious and loveable kid who’s used to bringing home flotsam and jetsam, and who’s left alone most days with nothing to keep him company but the ocean and six ambivalent cats. Is it any wonder that he tries to take care of a beached baby whale in his bath tub? Like the kitchen, Noi’s bathroom is spare but homey. Two robes, one little towel, a couple prints and a houseplant. All the items Davies includes seems really of the place, like you could reach out that window and find most any of them nearby. And like so many good picture books, he gives you just enough to feel full, for the place to feel real. 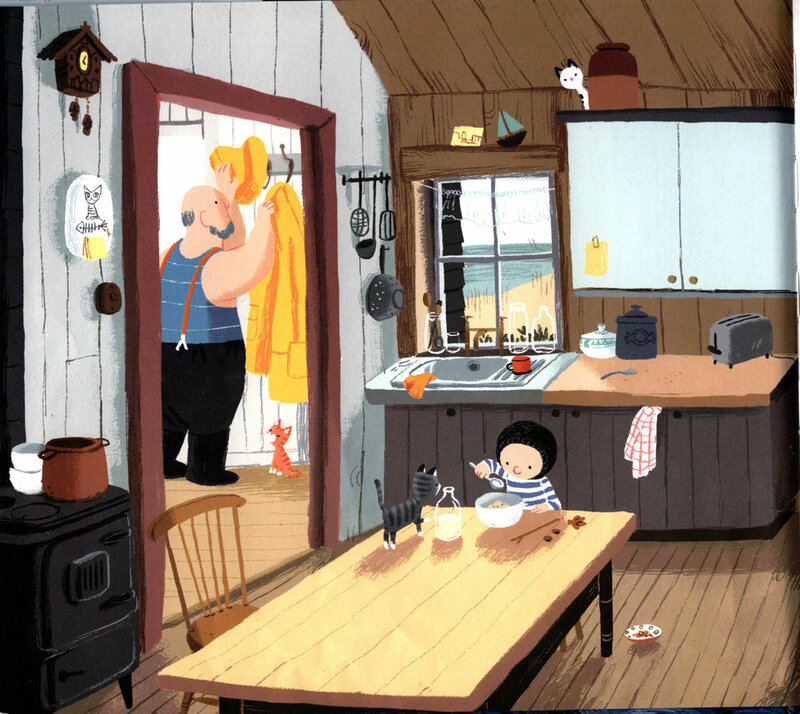 Towards the end of the book, once Noi and Dad have taken the whale back to the sea, we return to the kitchen. A lot of it is still the same. Same wood stove, same cuckoo clock, same cats. But there are two major differences. One is that Noi is painting his memories of the whale. We can see an earlier painting hanging on the cupboard. Maybe I am biased, but any depiction of art making is , to my eyes, positive. But the biggest change is that Dad is there. The boy doesn’t have to be lonely any more..
Then, in a wonderful final image, the whale and its parent echo Noi and his dad, promising that neither of them would ever have to be alone again. So. Interiors. Things. I have to admit, I sometimes give them short shrift in my illustrations. But what I’m learning is how important they can be to establishing place, mood, and character. They can define a life, and when done well, can spark joy. 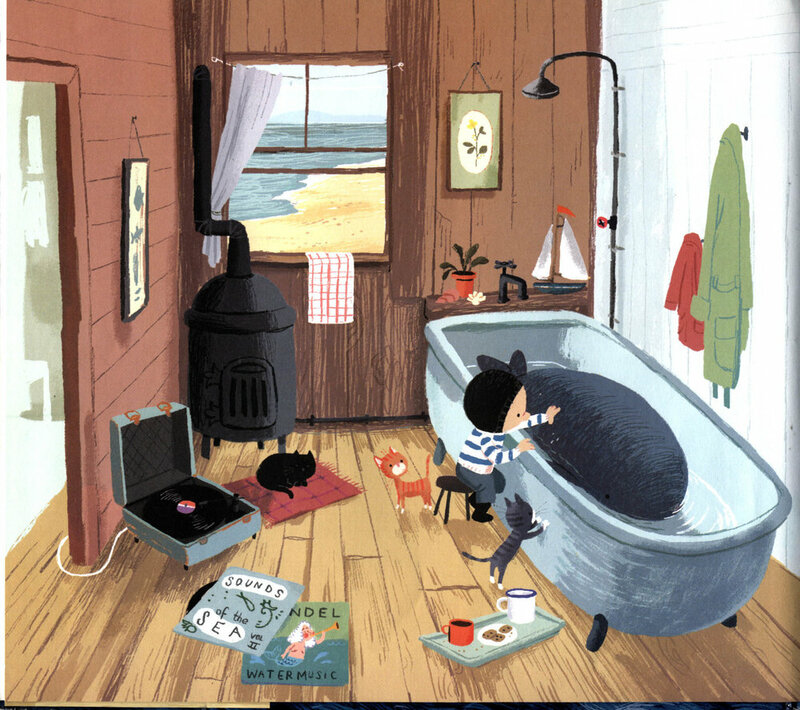 Do you know of picture books that have fabulous depictions of interiors? What about characterizing things? Let me know by posting in the comments below. I am always on the lookout for more. Thanks! If you’ve spent much time reading to kids, you’ve probably noticed they like to hear the same books again and again. They take a real pleasure in knowing the story. Oddly, this is a pleasure that we adults sometimes forget, especially if it is a book we find a little tedious. But for kids, that knowledge is comforting. They know what is coming and enjoy the anticipation of it. They don’t mind being a little scared because they know it’s all going to work out. And they get to feel the fear, or bask in the warmth, or laugh at the jokes, over and over again. I’ve heard this called re-readability, and though I think that is probably an awful word, the fact of it cannot be denied. One thing I learned from this repetition was how re-reading can deepen your understanding of a book, particularly the illustrations. Once you know what is going to happen, you can take your time and really look at what you’re seeing. How does the image reflect the text? How does it differ from it, or counter it? And, more specifically, what might be going on in the illustration that is not part of the text at all? These little second stories—or sideshows as I am calling them here—are usually comprised of some small detail: an extra character or a repeated object that appears multiple times throughout the book, and they tell you some other story than the one that appears in the text. One of the first times I saw this was when my friend Steve pointed it out while he read Good Night, Gorilla by Peggy Rathmann to his daughter. Steve is a gentle, generous guy, but not one to lavish praise on anything he doesn’t love. So, when he said, “Look at this, this is great,” I knew he meant it. What Steve showed me was the sideshow in Good Night, Gorilla. Good Night, Gorilla is a fantastic book, and you probably already know it, but just in case you don’t, here’s the skinny: It’s nearly wordless, but SO full of sweet story. In it, a young gorilla steals the keys from a zookeeper who is putting all the animals to bed. As the zookeeper says goodnight to each one, the gorilla follows behind, unlocking their cages. The liberated animals, in turn, follow the gorilla to the next cage until the whole parade of them follow the zookeeper back to his house and try to go to sleep in his bedroom. Lovely. But the second story, or the sideshow, has to do with a mouse, a balloon, and a banana. In the first spread, we see the gorilla filching the keyring from the zookeeper. But we also see a mouse tugging on the string of the balloon, which is wrapped around the bars of the gorilla’s cage and tied, at one end, to a banana. In the next spread, the gorilla has unlocked his cage and is free, but so is the balloon, which is gently floating out of frame. Meanwhile the mouse is cradling the banana and following the gorilla. Over the next five frames we watch that balloon get smaller and smaller as it moves up into the night sky, until about midway through the book, when we see it as just a pink speck next to the moon. And all this time we’ve seen the mouse lug around this preposterously large banana, with, it seems, no intention of eating it. On the last spread, after Gorrilla and Mouse have snuck back into zookeeper’s bed for a final goodnight, we see the banana for the last time, or, at least, the peel. Who ate it? Gorilla? Mouse? Both? I’m not sure for certain, but the fact that it’s gone marks the end of that little story, wrapped up just in time for the end of the book. Now as I type this, I hear you saying, David, wait. That’s not a story. A balloon floats away? A mouse lugs a banana? Where’s the conflict? Where’s the all-important arc? See, this is one of the great things about sideshows. They don’t necessarily need all that. They aren’t vying for our attention the way the first story is. Presumably, your book already has all that in the main story. The sideshow is just that: a little something extra happening on the side. It can be as simple as the balloon floats away. One of the points of it, besides just pure fun for the illustrator, is that it gives the reader something else to look for. I can’t tell you how much delight my kid has taken over the years in pointing out how, page after page, the balloon gets smaller and smaller, or the mouse toddles around after the gorilla. It’s one more thing for readers to track as the story unfolds, and since it is kind of hidden, kids enjoy looking for hints of them in progressive spreads as the main story unspools. Two other sweet little sideshows in Good Night, Gorilla are even less plot-dependent, but, to my mind, equally charming. First, the fact that the keys and the cages are color coded. Gorilla’s cage is orange. Fittingly, so is his key. The giraffe’s cage is green. Guess what color the key is? The second is even more dear. The animals all have little stuffed animals in their cages, and each stuffed animal corresponds to its owner. So the armadillo has a little stuffed armadillo and the lion’s cage has a tiny stuffed lion. Looking for the toy in each animal’s cage becomes one more of this book’s tiny sideshows. What I am learning is to look for opportunities in my illustration to put these extra little playful moments to work, to figure out ways to make them appear on multiple pages so that they become something a kid can look for in addition to the main story. And I am learning that these sideshows can be very simple, unburdened by the need for dramatic plot or conflict. The sideshow is like a secret hideout where your illustration goes to play. Do you know of picture book titles that make use of sideshows? Share them below. I’d love to make a big list!